Snowmen might well melt when winter’s over, but on Lynnwood property fun on the ice can last all year long. At the Lynnwood Ice Center folks chill out while ice skating, playing hockey and just enjoying one another. Spontaneous laughter breaks out during public skating times. Sessions mark the calendar seven days a week. Admission is under $10 with skate rentals listed at $4 a pair. The punch card helps regular attenders save money. Those on the ice swirl, twirl or hang on to the edge depending on skill level. Individuals wanting to improve their skating skills can happily sign up for lessons. Instructors work enthusiastically with students of all ages. From toddler to adult it's never too early or too late to learn. Year round programs place a focus on fundamentals. In no time athletes will be comfortably gliding around on the Lynnwood property. Hockey enthusiasts can pick up a stick and join in all the action. 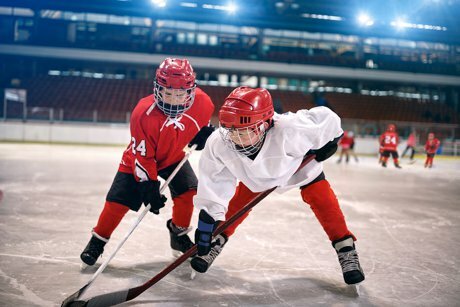 Hockey programs appeal to both youth and adults. The rink is members with several key organizations including USA Hockey, Seattle Jr Hockey, OVHL and GSHL. Lynnwood Pond Hockey Stick and Puck sessions allow for time on the ice to work on skills freely. Standard hockey uniforms must be worn including helmets. Kids wanting to learn the sport find this the ideal place to be. More information on how to sign up can be obtained by calling 425.640.9999. Quality programs are also offered for figure skating. Coaches on hand are experts in all levels of instruction. As a member of US Figure Skating and the Ice Skating Institute, participants may be reassured they are receiving only the best tutelage. Take a look at the listings of figure skating instructors here. Children living in Lynnwood delight in birthday party packages. The birthday boy or girl will be the star of their own show and the envy of those around them. Basic party packages feature a decorated setting, skates and rink admission. Deluxe options kick it up a notch.